The Nocturnal Library: Nice Dragon Finish Last Audiobook Clip! Nice Dragon Finish Last Audiobook Clip! A few months ago, I reviewed the first book in a wonderful new urban fantasy series by Rachel Aaron (also known as Rachel Bach, author of the Paradox trilogy). 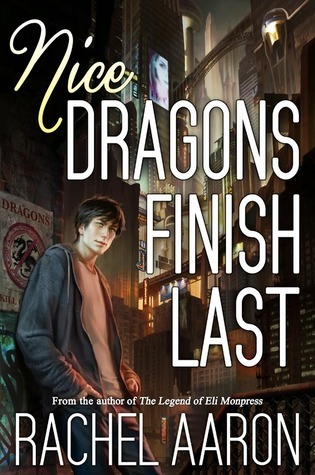 Nice Dragons Finish Last is a delightful blend of genres, and its protagonist, a young dragon named Julius, one of the most memorable characters I've come across in a very long time. You can read my full review HERE, but today I bring you a clip from the newly released audiobook. The clip is almost 30 minutes long, which is more than enough to see if this book works for you or not. I listened to it and I must say that I like the narrator very much. He does a fabulous job of bringing our whiny, hilarious Julius to life. If you've enjoyed this clip, jump on over to Audible to get your copy of the book. I promise you hours of pure entertainment with Julius and his never-ending string of disasters. Ok, I must have missed your post about this book because THAT TITLE IS AWESOME!! I'm surely gonna be listening to the audio clip now. Thank you for sharing Maja!! I do wish I had the attention span to listen to more audiobooks because I think this would be a great one to try! I think I have read her fantasy...maybe? Oh yeah I totally just bought it!! Oh nice. Sounds like a good book. Thanks for sharing the audio clip with us.